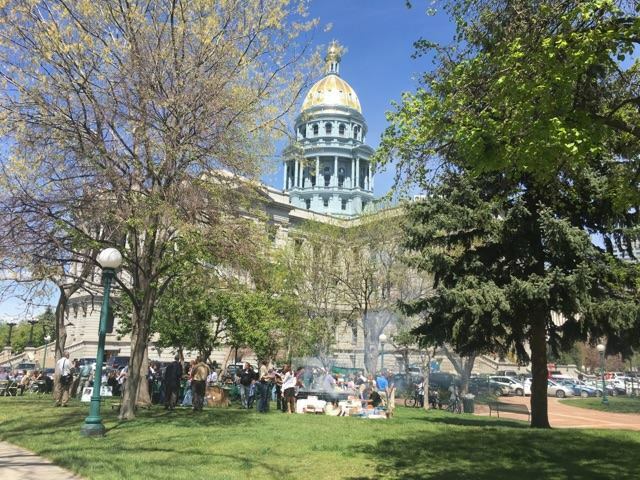 Check out ACPA National’s coverage of the 2019 CO/WY ACPA Annual Concrete Pavement Workshop! In this week’s continuing coverage of “Gold Standard” Chapter events, we’re pleased to highlight the Colorado/Wyoming Chapter’s 2019 Annual Concrete Pavement Workshop, held March 14. The “Pi Day” theme of the annual workshop gave Angela Folkestad, Jamie Johnson and Emma Dolan the opportunity to add some humor to the day-long event, but as the day of the workshop drew closer, talk of a large-scale snowstorm moving across the region proved to be no laughing matter. “My first thought was, ‘will it really happen?’ But, there was no way I was going to cancel just because of a snowstorm,” Angela says. “People in Colorado know how to get around in snow, especially people in the construction industry.” After all, big trucks and four-wheel drive vehicles are common, she adds. As the storm approached, calls started coming in from speakers, who said their flight plans (including double- and triple-booked alternative flights) were being canceled. Eventually, all but two out-of-state participants were grounded at home or at intermediate connection points. That’s when Angela reached out to ACPA staff, and Jerry Voigt (one of the grounded speakers), Andy Gieraltowski, and Bill Davenport to put a plan into action. With support from ACPA and the CP Tech Center, all the “remote” speakers were able to participate through live web-based broadcasting programs. “I was very relieved to have ACPA helping out throughout the day,” Angela adds. By the morning of the event, the bomb cyclone had dumped 5 to 20 inches of snow throughout the state, delivered winds gusting up to 80 mph, and dropped the barometric pressures to historically low levels, according to 9News.com. Angela praised Melody Perkins of the Colorado DOT, who was stuck in the storm on her way home the night before. After spending most of the night trying to get home, and then after only an hour of sleep, she presented at the workshop. Angela recognized Colorado DOT Chief Engineer Joshua Laipply for presenting at the workshop, in spite of the severe weather. It’s also worth mentioning Colorado DOT materials engineers from around the state spent most of the day before the workshop meeting in a dark conference room after the power went out in their building. “They didn’t want to miss their opportunity to meet while the whole group was in town,” she says. Angela also commended the remote speakers for delivering presentations seamlessly and complimented presenters and moderators who were at the conference, noting their flexibility in adapting to time changes and jumping in where needed. The use of the “webinar” program to link the remote speakers wasn’t the only technology put to use during the workshop. Two undergrads studying with Dr. Tyler Ley at Oklahoma State University, were able to attend, thanks to their arrival earlier in the week. Emily Rideout and Hailey Goodale, participated in the program and assisted with the Q&A following the presentations. They used a toll-free number where participants could text questions, a technology that led to a very robust exchange of questions and responses. “About half of the questions came through the texting program,” Angela says. Throughout the day, this writer observed that Angela, Jamie, and Emma, exhibited tremendous grace under pressure. The workshop delivered a wealth of technical information, program updates, and some hospitality and networking events, along with the Chapter’s paving awards program. Along the way, there were plenty of “Pi” jokes, which underscored the humor and forethought that went into the workshop. In the end, the workshop also showed that ACPA members, national and chapter staff, agency customers, and others excel through even the harshest conditions. Excellence in Concrete Pavement Awards: Submit Applications Today! Excellence in Concrete Pavement Awards – Deadline January 18th! Submit your applications today for Projects Completed in 2018! The Colorado/Wyoming Chapter of ACPA would like to invite you to submit nominations for the 2018 Excellence in Concrete Pavement Awards. These awards are given annually to concrete paving projects of exceptional quality and recognize the owner, engineer, and contractor of each award winning project. All projects in Colorado and Wyoming completed and/or opened to traffic by December 31, 2018 are eligible for consideration. All project submittals must be completed online at www.acpa.org/acpa-excellence-in-concrete-paving-awards/, which is on the National ACPA website. If you do not already have a login, you will need to register as a new user in the box labeled “Online Paving Awards Login.” After registering you will be able to generate your submittal, upload pictures, and edit your submittal until the submission deadline. You can create your submittal in multiple sessions by going to the link and logging back in using your username and password. Once you are logged in, click on “Begin an Application for a New Project.” Make sure to check the appropriate award category for your project and check “Colorado/Wyoming Chapter – ACPA” as the Local Paving Awards Program you are entering. For consideration, please submit a completed online nomination form by January 18, 2019. If you have any questions or need further assistance with the online submittal process, please contact Angela Folkestad.m by January 19, 2018. If you have any questions or need further assistance with the online submittal process, please contact Angela Folkestad.